Our hollow paddle dryer is perfect for the heating, cooling, drying and sterilization of materials for a number of different industrial applications. 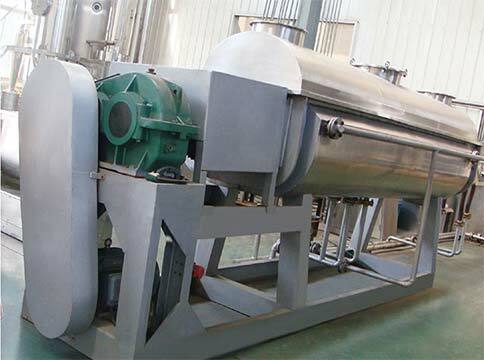 The machine is heat conduction type drying equipment with a horizontal stirring mechanism that can realize continuous operation to maximize production output. The paddle dryer is named for its stirring blade which resembles the paddle of a boat. The drying machine makes use of indirect heat conduction for optimal efficiency as the system minimizes air flow to reduce heat loss. The hollow paddle dryer is commonly used to heat-dry and stir materials in the petrochemical, metallurgy, food and pharmaceutical industries. It is ideal for drying powders, granules, filter cake and other types of slurry mixtures. 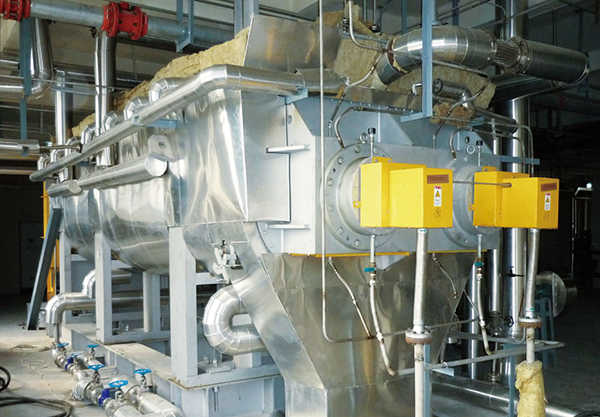 This industrial dryer was developed after years of research and analysis of domestic and foreign advanced technologies. Thanks to these developments we now have the equipment to dry, cool, heat, sterilize and perform low temperature calcination processes for a variety of different uses. The highly efficient design of the hollow paddle dryer’s wedge-shaped stirring paddle features a heat transfer function that plays a role in the drying process and serves as a self-cleaning device. 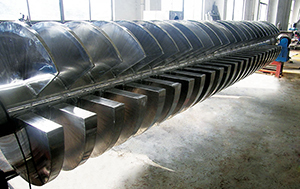 The heat transfer components of the hollow paddle dryer include the paddle itself, the stirring shaft and the surface of the wall of the drying equipment. The structure of the dryer is compact yet the volume of the drying area is maximized given the space available. The stirring dryer begins operation after the material is fed into the drying chamber and begins to heat and stir the load. The stirring mechanism is specially designed to uniformly heat all of the contents and break apart any clumps and large pieces that may form. The drying time depends on the moisture content of the material being dried as well as the specific properties of the material, so the process can take anywhere from a few minutes to several hours. The feeding speed, the stirring shaft speed and the temperature can all be adjusted to complete the desired drying process. 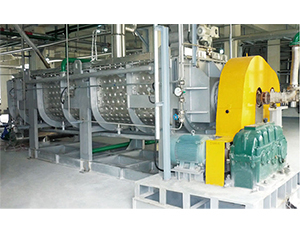 When the operation is finished, the hollow paddle dryer employs a piston driven discharging device to quickly and efficiently empty the drying chamber. 1. Minimal heat consumption: Due to the indirect heating within the chamber and the heat insulation layer within the exterior wall of the dryer, the heat that is generated to dry the materials is kept within the system. The amount of heat generated to evaporate 1kg of water is significantly less than what is required in an open air scenario. 2. Operating Efficiency: The drying unit’s is highly effective with minimal energy use and the entire device is built with a compact structure compared to similar industrial dryers, saving significant floor space within a facility. 3. Wide application ability: The hollow paddle dryer is suitable for working with heat sensitive materials. The typical media include, steam, oils and hot/cold water. The machine is built for continuous operation in any number of different industries. 4. Low emissions: When the dryer is in operation, the chamber is sealed as to keep any dust or vapors from leaking. Some evaporated mixtures require collecting emissions which is possible with a closed circulation within the system. 5. Low operating cost: The dryer only requires one operator to complete the drying process. The efficient design makes maintenance simple and infrequent. 6. Stable operation: The material is effectively mixed and dried due to the simple design of the blade and heat transferring surfaces. The entire machine maintains a standard temperature, humidity and mixing effect to maximize stability. 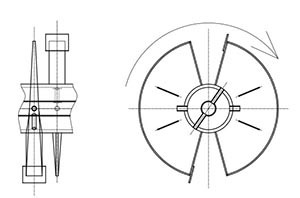 We’ll used the double shaft type of the hollow paddle dryer to explain the structure of the machine (paddle dryers include single shaft, double shaft and four shaft designs). The dryer has a W-shape shell with a jacket, upper cover, and two hollow shafts with paddles. 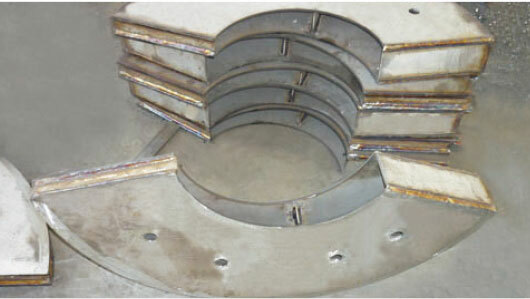 Each end has a cover as well as a swivel joint, flexible metal tube and a chain/gear transmission mechanism. The most important feature of the paddle dryer is the paddle itself. The design of the paddle is a wedge-shape hollow hemicycle that allows material into its hollow grooves as the shaft turns. Within the paddle is one of the heat transfer components. The two main heat transfer surfaces of the paddle are sloped so that when material comes in contact with the surface, granules will slip away from the paddle. The bottom of the paddle is triangular so that it avoids any dead corners within the chamber. polyolefin powder, polycarbonate resin, high and low density polyethylene, linear low density polyethylene, polyacetal particles, nylon 6, nylon 66, nylon 12, cellulose acetate, polyphenylene sulfide, propylene based resins, engineering plastics, polyvinyl chloride, polyvinyl alcohol, polystyrene, polypropylene, polyester, polyoxymethylene, styrene - acrylonitrile copolymer, ethylene - propylene copolymer. paper sludge, sewage sludge, leather sludge, municipal sludge, dyeing sludge, PTA sludge, electroplating sewage sludge, boiler ash, pharmaceutical waste, sugar industry waste, monosodium glutamate (MSG) waste, coal ash. 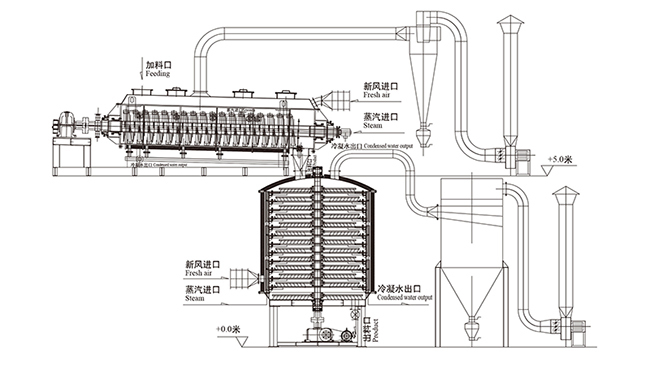 soy sauce residue, bone-based feed, distillers grains, food waste, apple pomace, orange peel, soybean meal, chicken bone feed, fish meal, feed additives, bio-sludge. starch, cocoa beans, corn, salt, modified starch, pharmaceuticals. sodium carbonate, NPK fertilizer, kaolin, bentonite, white carbon black, carbon black, phosphogypsum, sodium oxide, calcium nitrate, magnesium carbonate, sodium cyanide, aluminum hydroxide, barium sulfate, calcium sulfate, calcium carbonate, dyes, molecular sieves, saponin. Polyolefin powder, high and low density polyethylene, linear low density polyethylene, polyacetal powder, nylon 6,nylon 66, nylon 12, cellulose acetate fiber, polyphenylene sulfide, allyl resin, engineering plastics, PVC,PVA, polrviny benzene, polypropylene, polyester, polyformaldehyde, styrene~acrylonitrile copolymerization, ethylene propylene copolymerization. PTA sewage sludge, electrofacing water sewage sludge, boiler soot, pharmaceutical factory waste, sugar factory waste, coal ash. Soy sauce waste, bone matrix feed, distillers' grains, apple pomace, orange peels, bean pulp, chicken bone feed, fish powder, feed additives and chemical sludge. Sodium carbonate, NPK compound fertilizer, kaolin, bentonite, carbon-white, conductex, phosphogypsum, oxidation sodium fluoride, lime nitrate, magnesium carbonate, sodium cyanide, calmogastrin, barium sulfate, annaline, calcium carbonate, molecular sieve, saponin. The hollow paddle dryer is an extremely versatile piece of machinery. It is often applied for food, chemical, petrochemical, pharmaceutical and waste management purposes. The heat transfer, cooling and stirring abilities allow the device to perform low temperature calcination for certain ores, drying (solvent recovery), heating (melting) as well as sterilization for a wide range of materials. The stirring paddle uses a special compress-expand stirring function to ensure that materials are uniformly mixed every time. 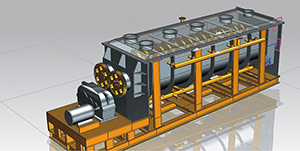 Using thermal oil as a heating medium, the paddle dryer can complete low temperature calcination operations. For example, Calcium sulphate dehydrate (CaSO4•2H2O) is calcined to calcium sulfate hemihydrate (CaSO4•1/2H2O) and sodium bicarbonate (NaHCO3) is calcined to Sodium Carbonate (Na2CO3). Using mediums such as water and cooling brines, the machine can also be used for cooling purposes. 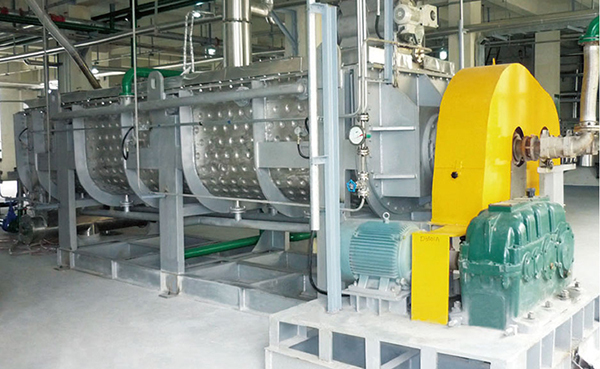 The device is often installed for cooling in sodium carbonate factories instead of recycled air cooling because it is much more effective and energy efficient. It also can be used for cooling titanium dioxide, ferro-nickel powder and other types of powder and granular materials. Material can be cooled from 1000 ℃ to less than 40 ℃. Another one of the primary functions of the machine is to perform solvent recovery operations. The energy consumption is minimal and the environment control is outstanding, making it suitable for materials that need to recycle solvents that are inflammable, are easily oxidized and other thermally sensitive materials. These features make the hollow paddle dryer perfect for the fine chemical, petrochemical and dyestuff industries. The heating and melting functions of the paddle dryer are exceptional for use in compound fertilizer and modified starch production. The large volume of the drying chamber along with its excellent heating ability allow the machine to effectively heat and sterilize materials without causing damage. 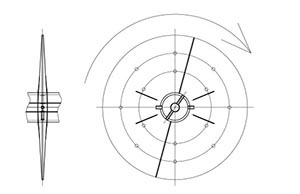 Remark : Model Below 120m, double axis, beyond 120m, 4axis.